The owner of this FJ43 is a classic car enthusiast who wanted a weekend driver for his second home in North Carolina. We completed a full, frame-off restoration and made a few subtle updates to bring this rig up to speed. The result is a classic Land Cruiser that looks (and smells) as fresh as the day it rolled off the line. The FJ43 is basically the extended version of the FJ40. Same iconic look, with more space for whatever the journey demands. Halogen headlights and PIAA® fog lights illuminate the way forward, while fully operational Warn® ZEON® 8 winch stands ready to deploy on demand. 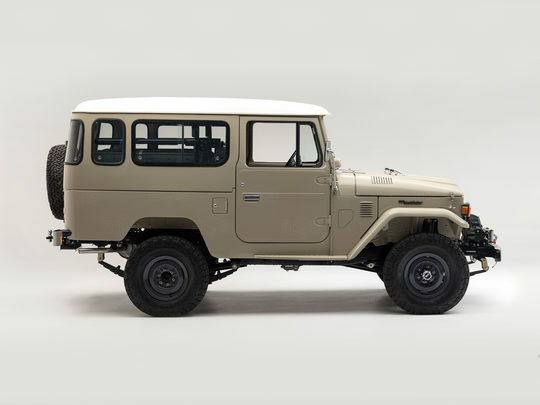 The body is constructed of the finest Japanese steel, painted in Dune Beige (416), and propped up by four steel wheels with heavy-duty tires. High-country or low, pavement or trail, this rig is up to the challenge. Durable. Reliable. Almost indestructible. This is the legend of the Toyota 2F engine, which is now completely rebuilt and ready to roar once again. Its new-found grit is balanced out by a refined ride that comes courtesy of the upgraded suspension system and revitalized power steering. Open the door to this FJ43 to enjoy the rustic nature of its classic cabin, infused with just enough modern amenities to keep you and your passengers comfortable. Take a seat behind the wheel to take in the classic stitching of the vinyl trim, the exposed nuts and bolts, and, of course, the familiar array of gauges and controls. Then, start the engine, connect your iPhone® (or another compatible device), and let the good times roll.